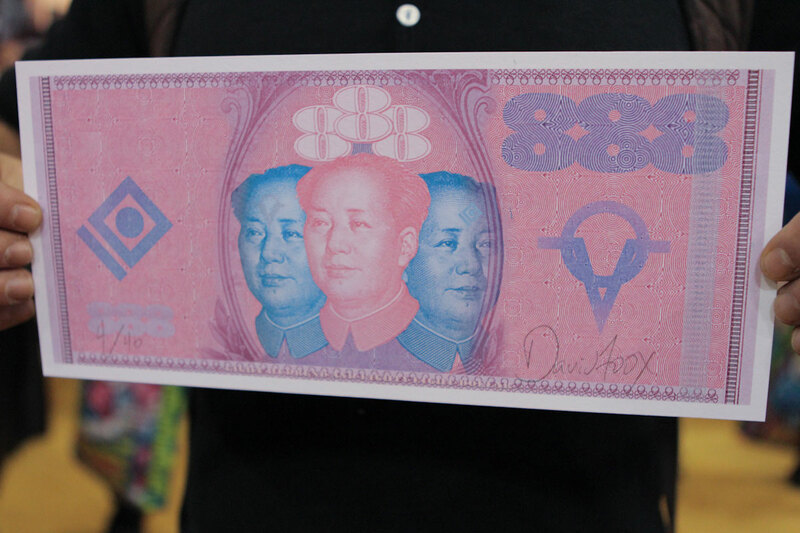 "The three headed Mao represents the mental dictatorship of the different faculties of human perception. The two third eyes on the left and right represent both the left (logic and reason) and the right (creativity and emotionality) as well as the negative and positive effects of the duality of the pineal gland i.e. the mind's ability to endow inanimate objects or ideas with spiritual value. The third and center Mao head represents the objective self and the pineal gland is represented by the tetragrametron which signifies the god consciousness, and the infinite unchanging laws of mathematics, chemistry and physics. Artist and Lawyer, David Foox (FOOX), spends most of his time in the financial district of NYC (otherwise known as Wall Street). Occupying a studio with over 100,000 sq foot of space and views that include the Bull, the Protesters, Lady Liberty, and Governors Island, inspiration is just a glance out the window.